We’d love your help. Let us know what’s wrong with this preview of The Compelling Community by Mark Dever. God's people are called to a togetherness and commitment that transcends all natural boundaries--whether ethnic, generational, or economic. But such a community can be enjoyed only when it relies on the power of God in the gospel. In The Compelling Community, pastors Mark Dever and Jamie Dunlop cast a captivating What does a community that testifies to God's power look like? To ask other readers questions about The Compelling Community, please sign up. While geared towards pastors and elders, I found this book helpful for guiding me in how to pray for church leaders. It was also helpful in showing the responsibilities of church leaders to the congregation and the congregation to the leaders. Really great look at the Christian community - the local church. A great mix of practical and conceptual. So much of local church ministry can seem mysterious when you’re not sure what the point of your community is. Dever and Dunlop give honest, biblical clarity to the mystery. 9Marks is straight killing it in the local church game. Can’t get enough of it! An excellent description & practical discussion of how the Church of Christ should function. Not by imitating today’s cooperate structures but functioning as the warm, caring, living organism known as the Body of Christ. An excellent Gospel-centered philosophy of ministry. I recommend this to all pastors. This book gives practical instruction which is part of the worship at CHBC. The book encourages pastors and leaders to make the worship in their assembly more compelling. The encouragement is to make the assembly not just a place to attend to satisfy your spiritual obligations, but a place where God is worshiped. The first part of the book started a little slow for me - if you're familiar with 9Marks, this will be mostly review - but the practical part of the book (the last 60% or so) is gold. I really enjoyed this book and it is full of biblical wisdom. It was wonderful to have an American book that offered solutions to the issues in the church that were not program driven, as if church is a business, but focused on the power of faithfully preaching and living out the gospel. It was wonderful that throughout the book the authors admitted that supernatural community comes from God and not from our efforts. However there are things we can do to get in the way that we need to identify a I really enjoyed this book and it is full of biblical wisdom. It was wonderful to have an American book that offered solutions to the issues in the church that were not program driven, as if church is a business, but focused on the power of faithfully preaching and living out the gospel. It was wonderful that throughout the book the authors admitted that supernatural community comes from God and not from our efforts. However there are things we can do to get in the way that we need to identify and stop. The book felt very baptist, as I would expect. I found it slightly ironic that after saying the solution to church unity wasn't program/ structural, that they offered strict official membership as the 'silver bullet' to supernatural community. Especially with new membership courses explaining different areas of what is expected of them. I have to say that felt quite program driven to me! The only real criticism is that I felt sometimes the Bible verses used didn't back up the points made as clearly as the authors made out. Often I felt conclusions were drawn beyond what the verses were actually saying. Therefore some of the points the authors made as being "clearly from the Bible" didn't quite have as solid foundations as you were lead to believe. This isn't to say their points were not Biblical or completely different from what the verses said, just that their conclusions were over stated. In "The Compelling Community", the author makes the case that the local church is meant to be a supernatural community that shows off the power of God by both its unity and its diversity. It is written primarily for church leaders and offers strategies for fostering and protecting community in your church. As such, it takes church membership seriously and sets a high bar for church members. 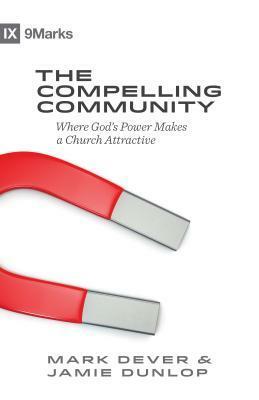 He goes further and suggests that the mark of a true Christian is commitment to a local church as a spirit In "The Compelling Community", the author makes the case that the local church is meant to be a supernatural community that shows off the power of God by both its unity and its diversity. It is written primarily for church leaders and offers strategies for fostering and protecting community in your church. As such, it takes church membership seriously and sets a high bar for church members. He goes further and suggests that the mark of a true Christian is commitment to a local church as a spiritual provider (as opposed to being a spiritual consumer). He writes: "All Christians are to be meaningfully and self-consciously committed to a particular body of believers, acting as providers rather than consumers. And this behavior doesn't exist to indicate that they are mature Christians, but that they are Christians." This is a well-written and thought-provoking book. As a leader in a small church, I found that many of his strategies and suggestions were geared towards larger churches. They were still helpful in sparking thoughts on how to apply this to my church family but you shouldn't approach this book as a formula for creating community in your church. The author also seemed to put a lot of emphasis on the need for good preaching as a prerequisite for Christian community. While good Biblical preaching is important, I don't think that it is absolutely essential for community. The Holy Spirit is perfectly capable of creating supernatural community even in the absence of strong preaching. centered around the gospel and supernatural in its commitment to one another. testimony of the truth of the gospel as well as the normal means of preserving the Christian faith. This book is an excellent blend of biblical teaching and practical experience. The main thrust of this book has to do with the kind of unity a church ought to have. Churches can be like social clubs where the unity is built around similarities, whether demographic or special interests. Other churches have mere unity on a shared confession of faith, or distinctive doctrinal points. Both of those are common and both of those fall short of the mark of communal unity of the Lord's churches in Script This book is an excellent blend of biblical teaching and practical experience. The main thrust of this book has to do with the kind of unity a church ought to have. Churches can be like social clubs where the unity is built around similarities, whether demographic or special interests. Other churches have mere unity on a shared confession of faith, or distinctive doctrinal points. Both of those are common and both of those fall short of the mark of communal unity of the Lord's churches in Scripture. Read this book! Buy this book! Do it now! Okay, enough with that. Seriously, this is a great book. I'd encourage any Christian to read and implement it. You won't find anything new, but what you will find is refreshingly ordinary and possible. In brief, Dever and Dunlop write that our churches should be communities which display the power of the Word to the watching world. Yet they contend that one major problem against this is the fact that our communities are gospel-plus¬–communities derived so Read this book! Buy this book! Do it now! Another great and practical book on the church. I was reminded that unity is primary in all situations except matters of high importance with high clarity in scripture. We also need to look at our ministry and honestly evaluate if we’re strengthening, or actually weakening, the body. Are we trusting in our natural means or God’s supernatural, yet ordinary, means of grace (the Word, fellowship, prayer & ordinances)? This is the first book I have read written by Mark Dever. I read this book in preparation for an upcoming church plant. It certainly made me feel as though I have been "playing church" for awhile. It does prepare you for planting a Christ-centered church and is also a great asset to assist you in your current church with a strong focus on the gospel message.. I thought this was a very good book with practical suggestions for creating community in your church, what to expect from the church leaders, and how to think about church planting verse church revitalization. “The Compelling Community”. Is not just for church leaders, but is a must read for all church members. Definitely recommend this book. Very helpful. In a day when attracting people to church through marketing and appealing to consumerism this is a solid, spiritual Biblical approach. There is solid theology as the foundation and practical application for the local church. I loved this book. Mark Dever has written in this book a lot of practical advice on how to center your church on reaching the community with the Gospel. How to get past a church built around small groups in specific walks of life and building a community that is comprised of all generations. Incredibly thought provoking and countercultural! This was my Aha! Answer to the question “Why do so many churches I’ve attended work so hard and still lack spiritual community?” Now to use what I’ve learned in my own life! A need for gospel-revealing community, built around diversity and differences, not similarity and natural affinities. “No one has ever seen God; if we love one another, God abides in us and his love is perfected in us” (1 John 4:12). Really brilliant, read it as a group of church elders and helped us to get beyond the simple buzzword of ‘community’ and into practical teaching and application from the word of God. Livro muito bom sobre o poder do Evangelho que, quando é pregado, cria uma Igreja sobrenatural. Second time through his book, and well worth it! A very compelling read to consider what it means for the church to be a compelling community. It is hip, cool, popular for a church to be multiethnic nowadays, but why? Are there any biblical basis for that? What does it mean for my local church? If you are thinking about these questions, go ahead and read this book, it's good. I have yet to read a book put out by the 9Marks initiative that I didn’t like. I’m so thankful for Mark Dever and the other wise and helpful pastors he’s gotten on board to help us learn about building healthy churches. They have been essential resources for pastors and church leaders, and The Compelling Community continues down that path. When I chose to review this book, I was reading mostly because a part of my role in serving at the church plant I’m working with is evaluating what we are doi I have yet to read a book put out by the 9Marks initiative that I didn’t like. I’m so thankful for Mark Dever and the other wise and helpful pastors he’s gotten on board to help us learn about building healthy churches. They have been essential resources for pastors and church leaders, and The Compelling Community continues down that path. When I chose to review this book, I was reading mostly because a part of my role in serving at the church plant I’m working with is evaluating what we are doing to build community in our church, not only as a church family but as a church that seeks lost people. Needless to say, a book with such a title was…compelling! Jamie Dunlop, basically piggy-backing off of Dever’s ecclesiology, does a great job teaching us the depth and breadth of what “Biblical community” really is. Gospel-Revealing Community Is Not A Quick Fix. Our tendency in reading church leadership books is that we use them to be instant catalysts in our church bodies, and, in turn, expect to see results immediately. But what Dunlop labors to show us is that building Biblical community in and out of the Church is not going to happen overnight, nor will it likely happen within a few months. It’s a slow-moving process, but years down the road it’s so rewarding. Are we committed enough to building community to the point where we’ll work hard for results we may never see in the Church? This really convicted me personally. Instead of being a “gospel-plus” community where we focus on marketing instead of relationships, the “gospel-revealing” community does not meet our immediate needs, and that’s okay. Are Our Relationships Formed By The Gospel, Or By Affinity? One of Dunlop’s biggest ideas is that we should have relationships that are only possible by the unifying and mysterious power of the gospel. What we find in evangelicalism today are “black churches,” “blue-collar white-family churches,” “cowboy churches,” “contemporary churches,” and so forth. Our church bodies are becoming based on likeness, not the transformative power of the gospel. Even in churches without a niche market, we see these affinity-based relationships taking over our small groups and segmentation of church services. Dunlop is clear — what should make the Church so unique is that it brings together a whole melting pot full of different races, classes, ages, and styles and becomes the foundation for our unified worship of God. People are Eternal; Therefore, Relationships Are Essential. One of my favorite chapters from the book is Chapter 7: “Build a Culture of Spiritually Intentional Relationships.” In this chapter Dunlop outlines practical and insightful reasons for being humble, hospitable servants in relationship with others. Here he expands our view of Biblical hospitality, church membership, and the necessities of personal example, preaching, prayer, and patience in building these relationships. At the core of this chapter, Dunlop makes a simple observation: people are eternal. This fact alone should drive us to pursue eternal people with eternal perspective and eternal patience! This book is really helpful for those looking for the practicality of building community, but also helps us pump the brakes a little and realize this isn’t a one-week process. The Compelling Community gets our engine started for running this important race, but helps us remember, only the gospel can transform in such mighty ways, and we’d do good to let Christ steer. Thanks again to the 9Marks team, Jamie Dunlop, and Mark Dever for a helpful resource. Some of the most edifying books I have read in the past decade have come with a 9Marks logo located somewhere on the cover. The Compelling Community, by Mark Dever and Jamie Dunlop, is another excellent 9Marks book that I found very helpful. This book, primarily written by Dunlop, focuses on lessons learned and principles derived from Pastor Mark Dever and the church the two authors lead and attend. Dunlop writes, “I want to raise the bar of what you envision church community to be,” and at the s Some of the most edifying books I have read in the past decade have come with a 9Marks logo located somewhere on the cover. The Compelling Community, by Mark Dever and Jamie Dunlop, is another excellent 9Marks book that I found very helpful. This book, primarily written by Dunlop, focuses on lessons learned and principles derived from Pastor Mark Dever and the church the two authors lead and attend. Chapter one argues that gospel-plus community–derived from natural means–may “work” to create community, but churches aspire to gospel-revealing community–derived supernaturally¬–that displays the power of God. Chapter two considers the impact of naturally derived community: compromised evangelism and compromised discipleship. Chapter three contrasts community built on comfort versus community built on calling and the evident supernatural quality of the latter. Breadth of community, and the diversity inherent in it, is considered in chapter four along with the difference between this and similarity based community. Chapter five looks at the interplay between the right preaching of God’s word and how it works itself out in God’s community. The focus of chapter six is prayer and chapter seven’s is on discipleship. The eighth chapter assesses impediments to community which may include staff positions, events, music, and ministries. Chapter 9 deals with the inevitable discontent and disunity that come with community with a focus on how the apostles wrestled with these issues. Chapter 10 examines Jesus’ teaching on sin in the church. Chapter 11 deals with the witness of the church community and evaluates how we can best expose the world to it. Church planting and church revitalization are deliberated in the twelfth chapter. My experience with 9Marks books and their teaching on the church has almost been entirely positive. Their books, and the ideas contained in them, are informative and inspiring. I find myself challenged, and motivated to rise to the challenge. This book, The Compelling Community, is no different in these regards. As a church leader, and one who desires to see the church be what the Bible calls her to, I recommend this book. This is a helpful (small) book that addresses fostering and protecting community in the local church. Specifically, Dunlop and Dever cast a vision for supernatural community in the church that thrives because of the gospel. The authors are concerned that despite good intentions, many churches build communities that can thrive regardless of the gospel. This isn't a "how to" book in the traditional sense, but it certainly has many practical tips for fostering and protecting community within churche This is a helpful (small) book that addresses fostering and protecting community in the local church. Specifically, Dunlop and Dever cast a vision for supernatural community in the church that thrives because of the gospel. The authors are concerned that despite good intentions, many churches build communities that can thrive regardless of the gospel. This isn't a "how to" book in the traditional sense, but it certainly has many practical tips for fostering and protecting community within churches. However, what's striking is how simple these tips are. Instead of starting programs in the church that offer ways of "signing up for" discipleship and community, they challenge pastors to give relevant applications in their preaching, model through example, pray, and patiently way. In this sense, the book is very encouraging and rather freeing. Many of their suggestions beyond that are small tips that will build a culture of community over time, which will foster long-term change in the church. Mark Dever serves as the senior pastor of Capitol Hill Baptist Church in Washington, DC. Since his ordination to the ministry in 1985, Dr. Dever has served on the pastoral staffs of four churches, the second being a church he planted in Massachusetts. Prior to moving to Washington in 1994, Dr. Dever taught for the faculty of Divinity at Cambridge University while serving two years as an associate Mark Dever serves as the senior pastor of Capitol Hill Baptist Church in Washington, DC. Since his ordination to the ministry in 1985, Dr. Dever has served on the pastoral staffs of four churches, the second being a church he planted in Massachusetts. Prior to moving to Washington in 1994, Dr. Dever taught for the faculty of Divinity at Cambridge University while serving two years as an associate pastor of Eden Baptist Church. In an effort to build biblically faithful churches in America, Dr. Dever serves as the executive director for 9Marks (formerly The Center for Church Reform, CCR) in Washington, D.C. 9Marks encourages pastors of local churches look to the Bible for instruction on how to organize and lead their churches. Dr. Dever also teaches periodically at various conferences, speaking everywhere from South Africa to Brazil to the United Kingdom to Alabama. Feeling a deep burden for student ministry, Dr. Dever often addresses student ministry groups at campuses throughout the country. He has also taught at a number of seminaries, including Beeson Divinity School in Birmingham, AL, The Southern Baptist Theological Seminary in Louisville, KY, and Trinity Evangelical Divinity School in Deerfield, IL. Dr. Dever’s scholarly interests include Puritanism and ecclesiology.